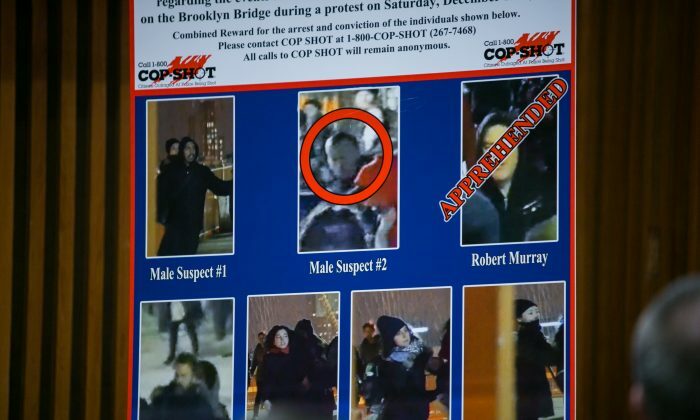 NEW YORK—Early Thursday morning Robert Murray, a suspect in the case of assault on two police officers last Saturday during mass protests, turned himself in, police confirmed. 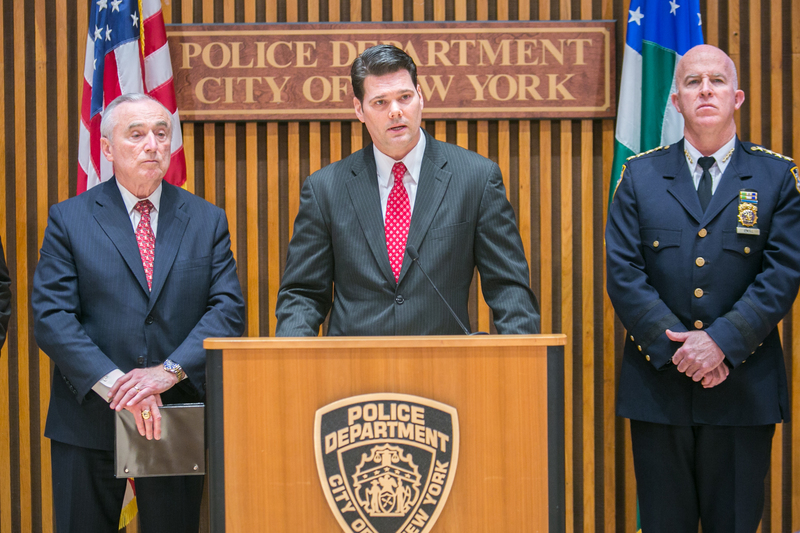 Murray, 43, who resides in Brooklyn, walked into police custody, accompanied by his attorney. Police are charging him for riot, assault, obstructing governmental administration, resisting arrest, and escaping. Murray is an organizer of a property services workers union, 32BJ SEIU, and has participated in past rallies. He was arrested before in 2004, during protests against the Republican National Convention that was held in Madison Square Garden that year. 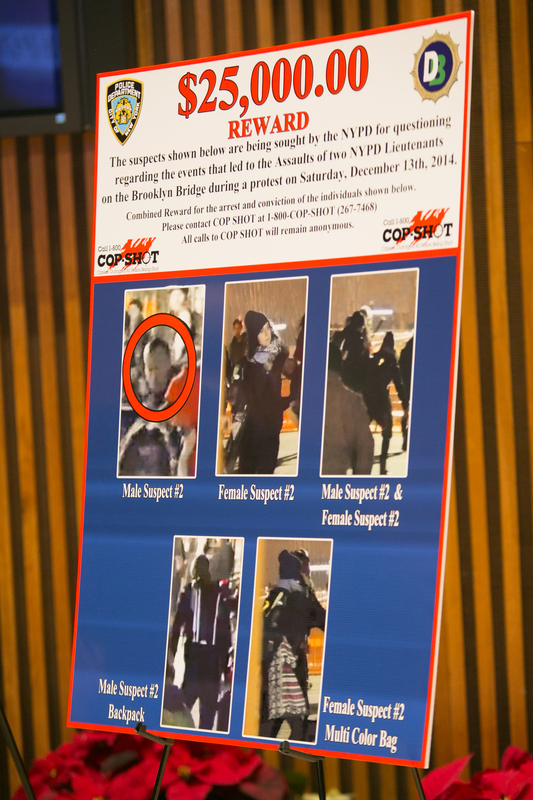 He is one of seven suspects—three other males and three females—that police are looking for. The other six still remain at large, but police say they have identified several of them with the aid of volunteered videos and statements from numerous witnesses. Protests against police brutality are held in solidarity with Eric Garner, a black man who died after being placed in a chokehold by a white police officer, Daniel Pantaleo, in Staten Island. The borough’s grand jury decided not to indict Pantaleo, which triggered mass protests that have gone on for weeks. Although protests have largely been peaceful, the exception came on Saturday during a march involving tens of thousands of protesters on the Brooklyn Bridge. An officer ordered City University of New York professor Eric Linsker to put down a garbage can. Linsker then threw a punch at the officer. Seven other men and women, including Murray, then kicked and punched two lieutenants, Patrick Sullivan and Philip Chan. They broke Chan’s nose and gave both men bruises. Murray pulled down police officers to prevent them from arresting Linsker and punched Chan twice. A witness said the sound of Murray’s fist hitting Chan was audible, according to police. Police said Thursday that Linsker’s role in the incident has grown clearer through investigation. The men and women attempted Saturday to prevent his arrest and were about to run away, before seeing that Linsker was still being held by police. They then began beating the two lieutenants to try and free Linsker. Photos of the seven were released on Tuesday and a $12,000 reward was offered for any evidence or information. The reward has since been updated to $25,000. Early Thursday morning, one of the suspects in the case of assaulting two police officers last Saturday during mass protests turned himself in, police confirmed.